Many Root-Workers start out working with spirits of the dead in the form of the Ancestors, the spirits of the dead connected to them by blood. It is believed that the dead don’t die, but rather ascend to another level of being, from which they can look on and assist us. From this higher level, the Ancestors can guide us in our daily lives, intercede with the Godhead on our behalf and protect us in times of need. The process of working with the Ancestors begins with the construction of an Ancestral Altar. Before I go any further, I’d like to point out that many root-workers are Christian and adhere to God’s commandment in Exodus 20:3 to “have not other gods before me.” Therefore, root-workers do NOT worship the Ancestors inasmuch as they venerate them. The Ancestral altar is the place where this veneration ritually occurs. It allows you to make a spiritual-connection with the other-side. It allows you the opportunity to develop a relationship with spiritual allies. It confers a certain amount of protection on you by inviting the spirit of loved ones who have passed to be an active part of your life. It allows you greater access to information in the form of your ancestor’s wisdom and experience, especially if they were a spiritual-practitioner as well or had a special talent or ability. It prepares you to work with other types of spirits and spirits that are not connected to you by blood. Setting up an Ancestral Altar is fairly simple and there is no standard layout for one. Like other altars they will often grow and change in relation to your personal belief-system, your understanding of how to put those beliefs into practice, the items you have and/or can obtain, and sometimes by request of the Ancestors themselves. Where to place your Ancestral Altar will depend on your personal-belief system, what you have available to use as an altar, and the amount of space that you work in. There really are no hard-and-fast rules on altar placement. Sometimes you will hear that an Ancestral Altar shouldn’t be placed in the bedroom due to privacy concerns when intimate moments arise with your partner. However, there really is no reason that you can’t put your Ancestral Altar in your bedroom except that it makes you feel uncomfortable to do so. Just because your Ancestral altar is in your bedroom doesn’t mean that your ancestors are bound to that room. If an intimate moment arises you can feel secure in the knowledge that the Ancestors would excuse themselves. If you have no choice but to place your Ancestral Altar in your bedroom, you can cover it with a white cloth whenever you think you may be intimate with your partner. An altar can be made out of virtually any available flat surface. This could be a coffee table, the top of a chest-of-drawers, a book-case, a shelf hung on a wall, an end table, etc… The only requirement for your altar is that it be large enough to hold everything that you wish to place upon it. For example, my Ancestral Altar is the top shelf of a bookcase which is located just inside my door. Before setting up the altar it is important that the area be cleaned. I usually wipe down the area with a damp rag and a few drops of ammonia followed by anointing the four corners and center of the altar with a tiny drop of Spirit Guide Oil or Peaceful Home Oil. A basic Ancestral Altar can be made with the following items. The items are placed on the altar in a manner pleasing to the eye. The practice of using a white cloth, white candles, and white flowers is derived from the belief that white represents both purity and cleanliness. Water is offered to the spirits to give them refreshment. However, sometimes the Ancestors will request that you offer them coffee, whiskey, or some other liquid to drink. When this occurs you should do as they ask. The Water is traditionally changed on Monday, however I personally do this on Sundays as this was the one day of the week my entire family was sure to come together. In addition to the items mentioned above, you may also place items which belonged to the dead in life, or items which they liked. For example you may have your grandmother’s glasses, or your father’s watch; you may choose to place a certain brand of cigarette on the altar because it was favored by an Uncle, or a cross-word puzzle book because an ancestor enjoyed completing them. In some cases, you may even decide to do things at your altar that you ancestor enjoyed doing in life. For example, if you mother loved to sew you may honor her by sitting before you altar as you sew a mojo bag or doll-baby. If your grandfather loved to read westerns you may purchase a book to keep on the altar and read it to him a chapter at a time. The only admonition when placing photographs on the altar is that you should never place pictures of the living alongside pictures of the dead. In addition there may be a deceased Ancestor whom you are uncomfortable inviting into your space. You two may not have gotten along in life, they may have been considered an ‘evil’ person, or have died ‘bad’, etc… If this is the case, I would suggest that you work with the Ancestors whom you are more comfortable working with in the beginning. After you have developed a relationship with these Ancestors, you may wish to ask them to assist you in making peace with the other individual(s). Again, how you work with your Ancestors, the prayers you say, the offerings you make, and how often you tend your Ancestral-Altar will depend upon your personal belief system. For example, Catholics are known for having prescribed prayers that they pray by rote such as the Rosary whereas Baptist prayers are often extemporaneous. It is up to you to decide what form the veneration of your Ancestors will take. As someone who was raised in a Baptist household, I often begin my veneration by lighting the white candle(s) and reciting The Lord’s Prayer. This was the first prayer I learned in Sunday School and many lines within the prayer speak to me on a deeply spiritual level for working with the spirits of my Ancestors. For example, the prayer begins “Our Father, who art in Heaven. Hallowed be Thy Name.” These words acknowledge God as our first-Ancestor, our Father. “Thy will be done on Earth as it is in Heaven”. Anything which occurs at the altar happens because God has willed it. “Give us this day our daily bread”, not my daily bread but our daily bread. This is a reference to making offerings to the spirits and the benefits we receive in return for our devotion. “Lead us not into temptation, but deliver us from evil.” This is a request to God that no evil spirit leads us astray or gives us bad advice as well as a request that no evil befall the spirits which dwell at our altar. This prayer may be followed by a spoken petition welcoming your ancestors into your home by name and asking them to commune with you, be tended by you, and to offer their personal gifts, wisdom, and/or protection to you, your home, and your living family (and yes even your pets). Some people work with their Ancestors every day, some approach their Ancestral Altar once a week, and some work with their Ancestors whenever they take a notion. I feel that it is very important to establish a regular practice of praying at your Ancestral Altar, if not every day then at very least once a week. Whatever you decide it is important to be consistent with your practice. The Ancestor Doll is a doll that represents all of your positive ancestors known and unknown and, for this reason, the doll will not have a face (see photo at right) nor will its gender be evident. However, in some cases a practitioner will make a female ancestor-doll, a male ancestor-doll or one of each depending on their personal choices. If you don't have any personal artifacts for a deceased family member, simply write their full name on a piece of paper and include whatever pertinent information you have (birth/death date) as well as any happy memories or stories involving that person. In this way you are preserving the memory of that event/story and creating your own personal artifact. To use the doll they are held, talked to, and can be carried with you when traveling. In this way the Ancestor-Doll is akin to a portable ancestral altar. 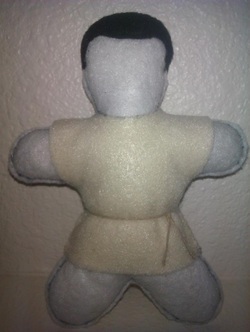 The Ancestor Doll is the perfect choice for anyone who wishes to honor and work with their ancestors but who has a limited amount of space to work with or for those who must work in secret for any number of reasons.